Budhvar, Wednesday, is dedicated to Lord Krishna and the planet Budh or Mercury. The day is also associated with Lord Vithal, an incarnation of Krishna . 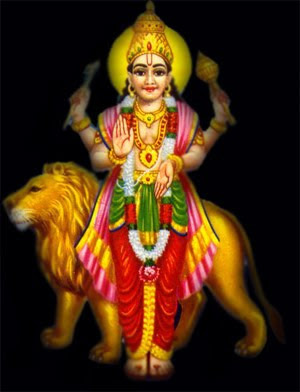 In some regions, Lord Vishnu is worshiped. Keeping a fast (Upvaas) on Budhvar is believed to help in leading a peaceful family life. Those devotees who undertake a fast on the day only take a single meal in the afternoon. The fasting is observed mainly by husband and wife together. Green color is considered highly auspicious on the day. In Astrology, mercury is considered to be compassionate and generous. Mercury is usually depicted riding a lion. Planet Budh is known as planet Mercury too.Lord Budh has four hands. Sword, Thaal, Gada and Varmudra are seen in his hands. Lord Budh has golden crown on his head and wears ornaments of yellow flowers and yellow clothes. According to the Atharv Ved, Budh was born to Chandrama and Tara. Since the child was very intelligent, Lord Brahma gave the name Budh to him. According to one story of Mahabharat, King Manu got married his daughter Ila to Budh Dev. King Pururva was son of Ila and Budh. According to Sreemad Bhagwat, the place of Budh Grah is higher by 2 lakh Yojan than Shukra Grah. Normally, Budh Grah is associated with good things. But when it crosses the way of Surya Grah, there is a possibility for Strong Wind (Cyclone), Flood and Drought. According to Matsyapuran, Budh Grah is yellow in colour, The Rath is white in colour and is glowing with bright light, drove by ten speedy horses. Budh Grah is the Lord of Mithun and Kanya rashi. Budh Pooja is recommended to reduce the tribulations caused due to malefic position of MERCURY in the horoscope. Budh Puja is to appease the planet Mercury. Budh Puja is very useful & beneficial puja, since it's worship strengthens benefic Mervury & increases its positive influence and pacifies malefic effects of the planet & neutralizes its negative effect. Budh Puja is recommended for those having malefic Budh or wrong placed Bhudh as per horoscope. Once there was a newly wed. On a Sunday, he went to his father-in-laws house to take his wife with him. It was the first time after marriage. He was welcomed by the in-laws and was provided with best food and bedding. His wife’s friends cut jokes with him. He enjoyed their jokes and conversation. He forgot the outside world as he enjoyed the hospitality offered to him by his wife’s younger brothers and sisters. Monday and Tuesday were spent in other pastimes. It was now Wednesday. He told his mother-in-law, I have an urgent piece of work today. You send your daughter with me immediately. But today is Wednesday. Mercury is not favorable to girls on Wednesday. It is considered inauspicious sending daughters in their in-laws house. I shall not send my daughter today, said the mother-in-law. I do not care for the Mercury. He cannot harm me. Wednesday is very favorable for the businessmen like me. I have also very urgent piece of work at home, said the son-in-law. The mother-in-law said. You came here on Sunday. Monday was your hospitality day. The guest should enjoy only one day’s hospitality. You have over-stayed. This is not our fault. How could we ask you to go away on Tuesday? It was for you to decide. Now, please go tomorrow for heaven sake. The son-in-law was adamant. He insisted on leaving the same day. The in-laws read his mood and agreed to send their daughter with him. They arranged a chariot for the couple. Soon, the couple reached near a township. The girl was thirsty. She said to her husband, I am very thirsty. Please arrange some water for me. The husband agreed and went towards the township. Another young man resembling her husband brought water for her. She could not distinguish between the two. She took him for her husband and had a good chat with him. In the meanwhile, her real husband appeared on the scene. He was surprised to see his wife chatting and cutting jokes with someone else. He was annoyed at her conduct. The wife also felt bemused when she saw the like of her husband standing with a water pot in his hand. Both the males quarreled among themselves and claimed the lady as their wife. Incidentally a constable came there and wanted to know what the matter was. He said to the lady, who is your real husband? The lady said, I am in a fix myself. They resemble each other so much. The real husband felt sorry. He remembered his mother-in-laws words. The constable took them to the king and told the whole story. The king asked his minister to administer justice. The minister said to the constable, it is late evening. Lock them up in separate cells. Arrange strict night watch. I will give my judgment tomorrow. All the three were locked up in separate cells. It was dead of night. Mercury had a Sound sleep. The real husband was very restless. He was repentant. He uttered loudly; I am suffering for my pride and disobedience to my in-laws. Oh God, forgive me this time. The guards were marking all these uttering. The next morning the minister sent for the guards. The guards related one of the youngmen's behaviors. The minister said, the man who had a restless night is the real husband. His wife should be restored to him. He should be freed. Produce the second person in my court. The guards went to the prison cell. They set free the real husband and his wife. They were happy to be together again. The guards went to the other young man. His cell was empty though locked from outside. They reported the matter to the minister. He was astonished to know that the cell was empty though locked from outside. He went to the senior minister and related the whole story. The senior minister smiled and said the missing prisoner is Mercury. Mercury rules on Wednesdays. This man challenged Mercury’s authority. He felt offended and disguised himself as her husband to teach him a lesson. Today Is Thursday. Jupiter rules on Thursdays. Mercury disappeared exactly at sunrise. Don’t be afraid. The guards are not at fault. The king was happy over his minister’s judgment. The husband and wife reached home and related the whole story to their near and dear ones. If you are suffering by Skin desease or if you stutter or if you have trouble with langaugae or pronounciation, this is the best Vrat(fats). Hindu devotees who fast on Wednesdays take a single meal in the afternoon. The ritual fast, i.e., 'vrat' or 'upvaas,' is observed by couples - the husband and the wife together. 'Budhvar Upvaas' or Wednesday Fastis believed to be auspicious for leading a peaceful family life. People start new business or enterprise on Wednesdays as the planet Mercury or Budh is believed to augment new projects. This day is also lucky for students and they pray for success in education.